RV 5th Wheel is the King of Campers! 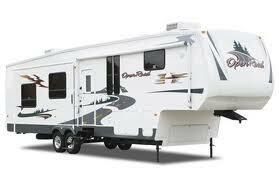 The RV 5th Wheel took over the RV Camper styles and hasn't looked back since!! This camper is probably the most efficient vehicle for space management produced today! 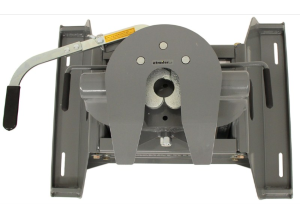 They figured out how to design a hitch that works on the same basic principal as tractor/trailer ones do, while adding precious space to the basic camper - a Win/win for everyone! 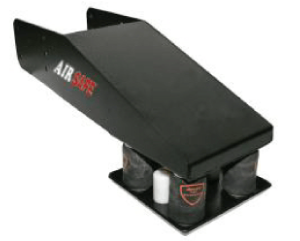 The pickup truck type vehicle, that usually pulls these, has a special receiver installed in the bed of the pick up truck. This "receiver" will then connect to one of several types of a "Gooseneck" coupler on the camper. The beauty of all of this is now the basic configuration of the RV Camper is now expanded to include a Master Bedroom (usually) in the front of the camper over the hitch area - Wow - that adds a lot of room to the basic design! Today's RV 5th Wheel will usually have at least one slideout room as part of it's overall structure to add even more living space to the "original camper". The end result is a very large "house on wheels" that has become the favorite RV Camper out there! These very large 5th Wheel trailers will have as many as 3 full axles supporting them and 3-5 slideout rooms - Massive! Now, you are talking about some LARGE Living Area! These are pretty heavy RV's, so the owners are being encouraged to go to a pick up truck that will have "dual" wheels in the back to help support it. These pick up trucks will have beefed up brakes, suspensions and engines to help haul these monsters up and down the highways! Even though these are the King of the "Non-Motorized" Campers, they still require a lot of "outside" setup and take down time to get them unhitched and leveled out. However, the fact that the pickup can be detached is a significant advantage when wanting to travel off road or into town - the "5th wheel" can stay behind! Here's a great video showing why a 5th wheel frame is designed the way it is and then how it is built. Courtesy of Excel RV's. Short Bed Pickup trucks are NOT suitable for the bigger 5th wheel trailers. The 5th wheel will hit the truck on sharp turns! !